Today's photo is the back door of Maxie's Southern Comfort restaurant. 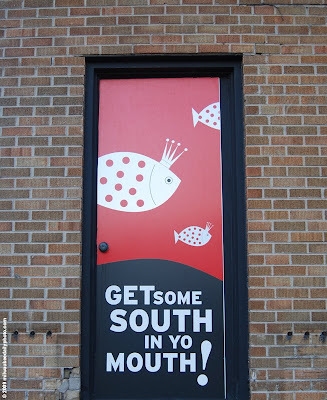 Specializing in southern cuisine and seafood, the tagline painted on the door certainly fits. Very interesting. What, I wonder, is "southern" cuisine? Grits? Chicken-fried steak? Okra? Mashed potatoes with gravy poured on top? Key Lime pie? We used to have a place here called Fat Johnie's. His slogan was, "Put some South In Your Mouth."